This is my first year with Bev's Mount TBR reading challenge and the time has come for the first progress report, known as The March checkpoint. Not done one of these before so hopefully I can manage to get it right. My aim for this year - the mountain I'm attempting to climb that is - is to climb Mount Ararat. That involves reading 48 of my own books before the 31st. DEcember. I thought that was doable as last year I read around 35 without really trying and 48 is only 4 books a month. My number of books read is 11. That takes me to within shouting distance of the top of Pike's Peak (12 books required for that), in fact I've started book 12 so am almost there. I am in fact almost a quarter through my challenge and pretty much on track as we're now a quarter of the way through the year of course. 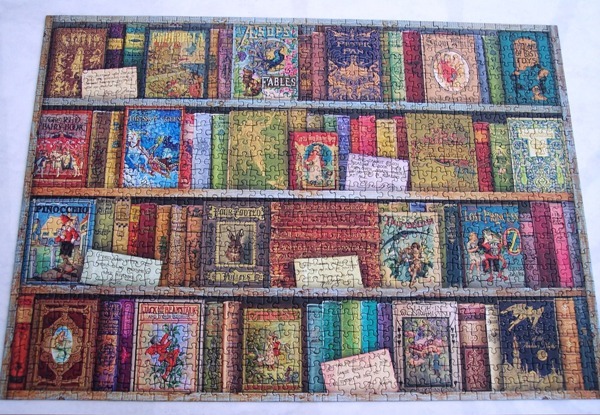 I did wonder if I might be able go beyond 48 books and am actually quite hopeful that I might eventually manage to do that. I like the first because it's a wonderful depiction of a snow scene on The Prairies in the 1800s. These Puffin covers are from the 1970s or 80s I believe and I'm a bit fond of this particular set. The second is just a stunning scene of an ocean on a man-made planet with the sky and the cosmos above. Beautiful. The third I simply like because of the colours used... and the depiction of the alien, whose name I now completely forget. It's just a damn good sci-fi cover, in my opinion. And the winner is? 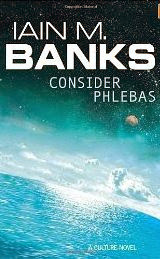 Consider Phlebas. Annoyingly, because I've passed the book on I don't know who is responsible for the artwork, but whoever it was - it's gorgeous. Well. I suppose, strictly speaking, that would be The Long Winter because it's been owned since the 1980s. The thing is, it hasn't been on my tbr mountain since then, it's been on the bookshelf in my grand-daughter's room and actually belongs to her mum. I didn't decide to read the Little House series until the last three or four years. 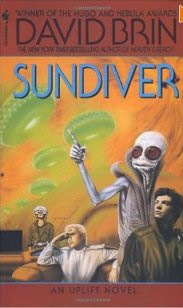 Probably the one that's waited longest is Sundiver by David Brin. I bought that on a trip to Memphis, Tennessee in 2006. Our hotel was a short ride away from a mall where there was a Barnes and Noble and we went there several times to escape the heat, *and* buy books. I came home with 4 David Brin books and they've languished on the shelf ever since. 'Was it worth the wait?' Frankly, no. It wasn't a bad book by any means but I had hoped for a slightly more involving science-fiction read. Not sure it was worth bringing back in my suitcase to be honest. But there you go, win some, lose some. My first book for Carl's Once Upon a Time VIII challenge is Among Others by Jo Walton. The first thing I'll say is that Mori is a delightful narrator for this book. The story is told via her diary and is thus written in first person, a form I love because it enables the reader to really get to know the narrator... *if* of course the author has the skill. I'm pleased to report that Jo Walton has the skill. In spades. Mori's personality jumps right off the page at you, she's incredibly brave; not the kind of person to bewail her fate she just gets on with life making the best of the poor hand she's been dealt. I love her Welshness, despite being thrown into an English boarding school she's fiercly loyal to her Welsh roots and her family and very upset when she realises the school has inadvertently changed her. But of course, what I really loved the most about young Mori was her devotion to science fiction books and, to a lesser degree, fantasy. 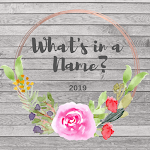 Samuel B. Delany, Robert Heinlein, Robert Silverberg, Anne McCaffrey, Ursula K. Le Guin, Tolkein, to whom she's devoted, ... way too many authors to list them all to be honest. This book is a science fiction fan's idea of heaven. 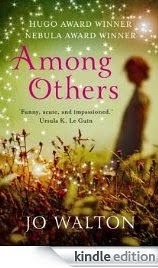 Mori recounts the events that are happening in her life in a very matter-of-fact way and the books she reads form a very natural part of the telling of the story: it's quite clear they are part of the very fabric of her being. It's seamlessly done - really, really clever writing. As with all clever stories information is fed to the reader in a slow drip-feed. How Morganna died, what the problem is with the mother, what Mori's former life in The Valleys was like and so on. We watch as she grows up, her struggles at school with other pupils, her struggle to find friends and how her life is slowly transformed towards the end of the book. Her ambiguity as regards doing magic and her dealings with the fairies is a real source of unease for her, she worries constantly about what kind of person she is. Is she good or evil? We know of course and it's quite heart-breaking to see her inward struggle to make sense of it all. I feel incredibly lucky to have happened on Among Others as my first book for the Once Upon a Time challenge. I've had it on my Kindle for a year or so and not got around to it so now was the perfect time. The author, Jo Walton, is apparently a Welsh-Canadian, not sure which part of her nationality is prevalent but the writing just felt Welsh to me. Among Others won the 2011 Nebula award for best novel and the Hugo award in 2012 for the same. I'm not remotely surprised. I'm currently reading her new book of essays about rereading science fiction, What Makes This Book so Great. Already I know I'm going to want to own it (it's a library book) and plan to stick it on my birthday list in a few weeks time. So that's my first book read for Once Upon a Time VIII, and Among Others also qualifies as my book 11 for Bev's Mount TBR challenge. Spring has officially sprung and that means the return of one of my favourite reading challenges, Carl's Once Upon a Time VIII. *Eight* years, goodness that's pretty good going. Not sure how many of those I've done, possibly five or six. Anyway, without further ado, my sign-up post for this year's Once Upon a Time. The hauntingly beautiful artwork this year is by Melissa Nucera. And I always love the verses Carl chooses to accompany his introductory challenge posts. The important thing to note for me personally is that nearly all of these are books I own. (Fyre belongs to my grand-daughter. *Virtual wave* to her as I know she sometimes reads this blog. And I don't yet own Death by Silver but plan to soon.) I really want to read from my tbr mountain this year... some of these books have been on my shelves for years and it's high time they were read. 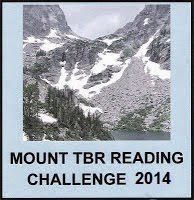 Plus some will also qualify for the Mount TBR challenge... which is good. So that's it, thanks to Carl for once again hosting this challenge and good luck to everyone participating. Two non-fiction books today. I've been reading these over the past few weeks as I always like to try and have some factual books on the go as well as fiction. First up, a book that qualifies for Bev's Mount TBR challenge, West With the Night by Beryl Markham. Beryl Markham was born in England in 1902. Her father was a race-horse trainer and when Beryl was four he moved the family to Kenya, which was then British East Africa. Her mother apparently didn't like the isolation and moved back to Britain. Now either this wasn't mentioned in the book or I missed it or have forgotten it, which is quite possible, but I wondered where she was and assumed the she'd died. Whatever, Beryl was brought up by her father and led the sort of childhood where she ran wild and free with the local tribesmen's children. She also learnt about horses and at seventeen was a competant trainer herself. Which was just as well because her father suddenly decided to try his luck in Peru and Beryl didn't want to go. So off she went, on her own, into the wilds of Africa, to apprentice herself to another trainer. She must have been one tough cookie, that's all I can say! A chance meeting with a chap called Tom Campbell Black, tinkering with a motorcar on the side of the road, led to her deciding to learn to fly. Which of course changed her life forever. First of all I must say that this is one of the most beautifully written books I've read. The writing is lyrical and poetical and I don't think I've ever seen Africa described in such stunning detail. After I'd finished reading it I looked Beryl Markham up and chanced on the suggestion that she may not have written the book at all. She was married to a writer when the book came out and apparently he might have written it. Well, I assume it's a valid point of view, but and for me it's a big 'but'... how can anyone who has not had these experiences of Africa possibly write about it so personally and intimately? Sorry, I don't buy it, but that's only my opinion. Whoever wrote it wrote something very beautiful and well worth reading. Beryl Markham's life was amazing and this book only touches on the first 25 or so years as far as I can see. She was a brave, courageous woman who had to make a living in what was then a man's world and who chose two occupations that women simply did not partake in: race-horse training and flying. She was the first woman to fly solo across the Atlantic and did it from east to west when the men had done it the other way round. She was close friends with the Blixens and Denis Finch-Hatton who were the subjects of the film, Out of Africa. 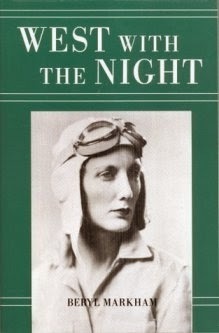 There's a lot more to know so I plan to get hold of Straight on Till Morning: the Biography of Beryl Markham by Mary S. Lovell (she also wrote about the Mitford Sisters). The other thing to add is how these non-fiction books are often connected with one another, particularly when the times or settings overlap. Beryl stayed in Shepheard's Hotel in Egypt as did Agnes and Margaret from Sisters of Sinai. And when she flew to England with Bror Blixen she describes with great detail the forts the Italians built in Ethiopia after they had annexed the country in 1936... just as Sandy Curle described them in Letters from the Horn of Africa. I do like these little connections and of course they lead you on to find even *more* books that you absolutely *must* read! I just want to add that this book was intended for the charity shop box but push came to shove and I really couldn't part with it. The second non-fiction for this post is The Middle-aged Mountaineer by Jim Curran. About two thirds of this book is about Scotland so I think it pretty much qualifies for Peggy's Read Scotland 2014 challenge. Author, Jim Curran, is well known in mountaineering circles, not only as a climber, but as a cameraman, documentary maker and writer. He's written various books about mountaineering including, K2:Triumph and Tragedy about the climbing catastrophe there in 1986, and a biography of climbing legend, Chris Bonnington. 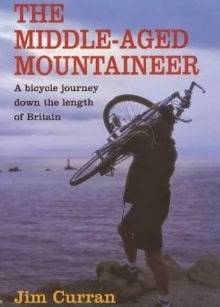 This book is about Curran's decision to cycle from the northern tip of the UK, ie. 'Shetland', to the southern tip, which is on the Lizard peninsula in Cornwall. He plans to climb some mountains along the way, call in on a few mountaineering friends and so on. Thus I rather expected this book to be about climbing mountains: but it wasn't. Middle-age and an injured hand rather put paid to any ideas he had of revisiting old climbs but luckily the book is still interesting and enjoyable. Curran himself comes over as a fascinating person who has had many amazing experiences on mountains, and which he doesn't stint in recounting to the reader. His friends and acquaintances read like a who's who of mountaineering. It's the first part of his trip, through Shetland and down through mainland Scotland which is the most interesting and which therefore takes up the majority of the book. Gorgeous descriptions of scenery and the variable Scottish weather; lots of enjoyable encounters with friends and strangers; and he revisits the Old Man of Hoy to meet the oldest man to climb it, Mike Banks, and where Curran himself had filmed a documentary about the French climber, Catherine Destivelle. I think I may have seen that actually. In some respects this book is similar to one of my favourite reads last year, One Man and His Bike by Mike Carter. Both men loved the Scottish leg and seemed to feel rather a sense of anti-climax once they'd left Scotland and were faced with cycling through England. In fact Curran stopped off at his home in Sheffield, on the way, and nearly didn't get back on the road again. It leads me to conclude that Scotland must have something which England doesn't and it can't just be fabulous scenery. Nothing for it... I'll just have to get up there and find out for myself. Still reading the crime and mystery yarns so here are three more read since the beginning of the month. This first book, The Nine Tailors by Dorothy L. Sayers, qualifies for two of the challenges I'm doing this year. Firstly, I read it for Bev's Vintage Mystery challenge and it covers the category, 'A Book with Number in the Title'. 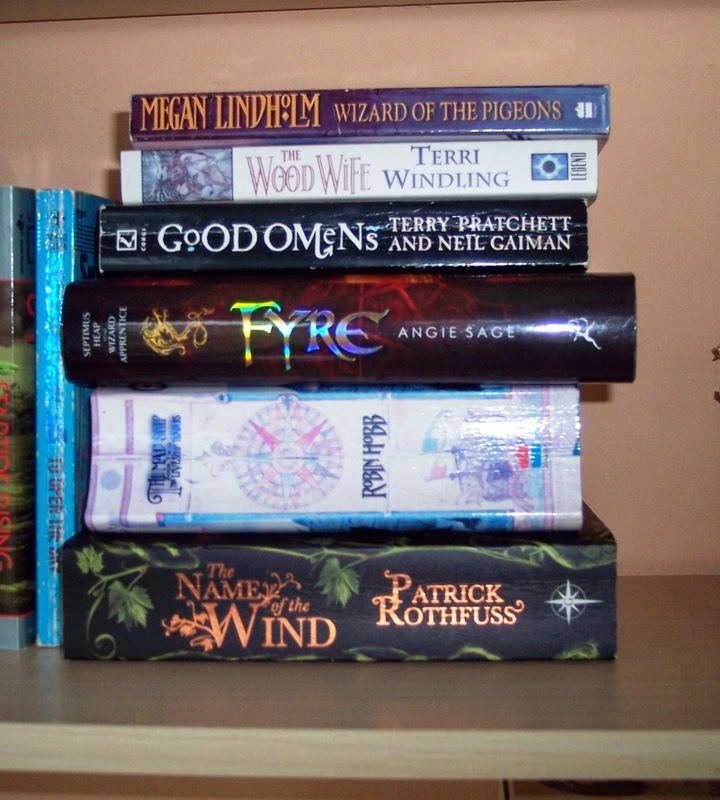 Secondly it also qualifies for her Mount TBR challenge and is my book eight for that. 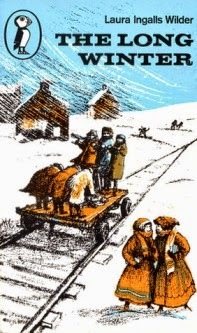 Lord Peter Wimsey and his valet, Bunter, run their car into a ditch, in a snow-storm, somewhere in The Fens of East Anglia. They walk to the nearest village and get taken in by the local vicar and his wife. Wimsey is a bit of a church bell-ringer it turns out and gets roped in to ring for a marathon, all night, bell-ringing session. The car is recovered and off they go, only to be called back some weeks later. The body of a man has been found in the grave of a local woman, only recently buried. No one knows who he is and the hope is that Wimsey can untangle the mystery. It seems it might be connected with the theft of a valuable necklace several years ago which brought financial ruin on the people who live in the local 'big house'. The woman whose grave had been used to hide the body belonged to this family. Two men had been caught and tried for the theft but the necklace had never been recovered. The case is incredibly complicated, bell-ringing and bell-ringers seem to be crucial to the case and Wimsey even has to travel to France to unravel this extremely tangled web. I just thought this was absolutely brilliant. 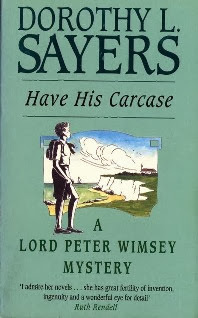 I don't know enough about Lord Peter Wimsey (having only read three of the books so far) to judge properly but it seemed to me that he was more serious in this book than in the others. Less of a twit, if that makes sense. I don't know why that should be and of course it could just be that my impression is wrong. Whatever, this really was a terrific read, very full of detail about bell-ringing, very much a picture of village life before the war I suspect, and spot-on with its setting and atmosphere of The Fens. I haven't been there in the winter but can well imagine it would feel that isolated and insular. The writing is spectacularly good, this is one of the big surprises I've had about Sayers and her books: her writing is every bit as superb as any classic author you care to name. I'm so glad I still have a number of these Peter Wimsey books left to read and feel I ought to slow down a bit or I'll end up gobbling them all up at once! Next up, Touch Not the Cat by Mary Stewart. I read this one for the My Kind of Mystery challenge which is being hosted by Carolyn at Riedel Fascination. 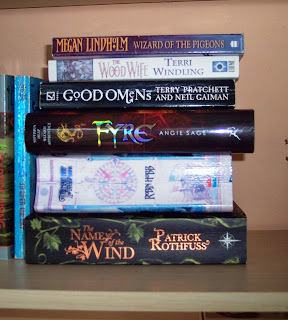 It also qualifies for Bev's Mount TBR challenge and is my book nine for that. The death of her father brings Bryony Ashley back to her ancestral home, Ashley Court. She will not inherit the run-down small stately home, it will go to eldest of her three cousins as the estate is entailed through the male line of the family. Bryony grew up with her three cousins, twins Emory and James and younger cousin, Francis. She believes she has a telepathic connection with one of them but has no idea which. In fact she has grown up with his voice in her head and whoever it is is now part of her. But all is not right at Ashley Court. There is some question in her mind about her father's accidental death in Germany. His last words were written down and provide a cryptic message to her which she feels she must solve. Her cousins, the twins, are acting strangely too, creeping around in the church at night and making her feel slightly menaced. What's going on? Bryony desperately needs to solve her father's mysterious riddle but this will bring her into conflict with her family and possibly lose her the thing she holds most dear, the voice of her lover in her head. This is one of those books that comes into the 'OK' category. I didn't dislike it, but neither did I love it. To be honest I found it a wee bit dated, very much of its time period which is the mid-1970s, and at that time it seems some authors were still writing about 'naice gels' getting themselves into a spot of bother. It was well written, no doubt about that, and the mystery - what the cryptic message was all about, whether her cousins are Bryony's friends or enemies, and the identity of the voice in her head - was quite fun and enjoyable. 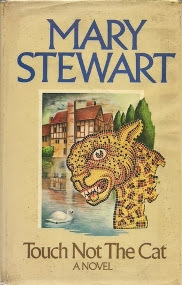 I have a feeling Mary Stewart wrote better books than this, in fact I know she has as I've read her Merlin trilogy and loved them. I have several more to try and suspect I may find them a bit more to my taste than this. Lastly, Fer-de-Lance by Rex Stout. 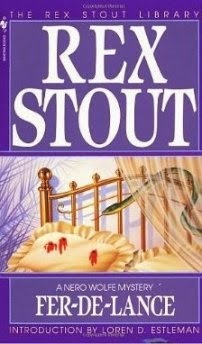 This one was also read for Bev's Vintage Mystery challenge and covers the category 'A book with an amateur detective'. A woman comes to see Nero Wolfe to ask him to find her missing brother. It seems the brother might have been involved in some kind of criminal activity from which he hoped to make a lot of money. Another man dies on a golf-course the victim of a bizarre kind of murder by poisoning. Are the deaths connected? Wolfe thinks so and sends his young employee, Archie, to investigate. The case takes Archie among the well-to-do families in Westchester county, New York, and the whole thing turns out to be very convoluted indeed. Fer-de-Lance is the first book about Nero Wolfe and his sidekick, Archie. Wolfe is a very big man who never goes out and is deeply into the growing of orchids and the eating of good food. He's the brains behind the outfit and Archie, the story's narrator, really just follows instructions. It's an odd basis for a series of books with the main crime solver solving the crime by mental deduction and never going out to visit crime scenes; if he wants to question a suspect they have to be brought to him. This was another book that I neither loved nor hated. I can't say that any of the characters appealed to me that strongly and I never felt that involved in the plot, but am not sure why. I think possibly that when it comes to 1930s crime yarns I prefer British to American. It *was* all quite clever however and as it's a first book I'm happy give the series another chance and read more. It could be I'll like subsequent books more than this and I have several on my eReader to try. 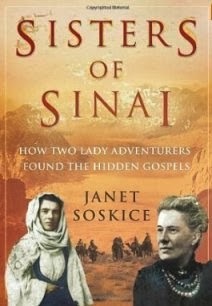 My third book for the Read Scotland 2014 challenge which is being hosted by Peggy at Peggy Ann's Post is Sisters of Sinai: How Two Lady Adventurers Found the Hidden Gospels by Janet Soskice. Twins, Agnes and Margaret Smith were born in Irvine, Scotland in 1843, Agnes being the older of the two by half an hour.Their parents were John and Margaret Smith, their father being a lawyer. Their mother died two weeks after their birth and John never mentioned his dead wife's name again. He concentrated instead in bringing his daughters up as God-fearing Scottish Presbyterians and, something unusual in those days, educating them to the best of his abilities. He discovered that the girls had a gift for languages and made a pact with them - that for each language they learned they would get to visit that country. Thus at quite a young age both girls spoke French, German, Spanish and Italian. When the twins were thirteen a distant relative left John Smith a huge amount of money and he became one of Scotland's richest men. The girls were sent to boarding school and then to finishing school. It was thought that like most young ladies at that time they would marry early and that would be that. Sadly, John died in 1866. At the age of twenty three his daughters were unmarried still and very, very rich. Not to mention rather well educated. They set off on a trip down The Nile. It was to be the first of half a dozen trips to Egypt that the twins would make in their lifetime, and also rather a steep-learning curve in how to deal with the likes of the dragomans who basically controlled your trip. The one thing Agnes learnt from this trip was the necessity of speaking the language of the country you're visiting. The girls went home and learnt to speak Arabic. On their next trip to Egypt Agnes and Margeret were heading for the Sinai desert. Mount Sinai to be exact and the ancient monastry of St. Catherines. Professor Rendal Harris, a friend of the twins, had suggested to them that an important biblical text might be hidden in a cupboard in the monastry and they were hoping to find it. And find it they did. It turned out to be palimpsest, a manuscript that has been overwritten by something less important. In this case the hidden text was one of the earliest copies of the four gospels, and might prove that the gospels had not been written, as had been suggested, 400 years after the death of Jesus, but instead much, much closer. The twins took over 400 photographs of the pages and brought them back to Cambridge where they were now living. It took them some time to get the experts there to even look at the photos because of course they were just women so how could they know whether what they had was important? Once it was known what the manuscripts were though, a return journey was necessary with two experts in the language the manuscripts were written in: Syriac. Again Agnes was to realise the mistake of not knowing a language. The two professors tried to elbow them out of proceeedings and the expedition, though a success, soured relations within the group. Agnes's mission when she returned home again was to learn Syriac, thus being the one in charge of the sisters' exploring and academic lives and not have to rely on men whose main mission seemed to be to take the glory for themselves. Anyone who knows me is probably wondering why I wanted to read this book. Is it ostensibly about two very religious women looking for proof of their beliefs. Being a non-believer this shouldn't really interest me at all. But I was watching a BBC docmentary called The Bible Hunters a few weeks ago and the author of this book, Janet Soskice, was one the contributors to the programme. Now I love tales of Victorian explorers (which was why I was watching in the first place) and mention was made of the book this author had written. Luckily, I discovered that Devon libraries had just one copy, in Exeter, and my son-in-law very obligingly grabbed it for me on one of his trips there. I have to say I was slightly daunted as it looked like quite an academic tome but I needn't have been concerned. It is quite academic, but if an ignoramus like me found it easily accessible, then anyone would. Agnes and Margaret were nothing short of amazing. In a time when it was thought that a good education was not what women needed as their brains wouldn't cope, they were blazing the trail for female education. Only a few universities allowed women to study at them, and but they were not allowed to gain degrees. Cambridge was one of the last to allow that, even though Agnes and Margaret themselves founded a college there - Westminster - and it was foreign universities, German and Irish, who endowed them in the end with honorary degrees for their services to the academic world. And quite rightly so. February is obviously a short month and was busy, mid-month, for me but nevertheless I still managed to read ten books again. Not sure how... although I have a brand new Nook on which I read a couple of the following books and I notice I read a bit faster on ereaders. Why this should be I'm not sure, possibly because I can adjust the font to suit my aging eyes. Whatever, I have to say I'm very fond of my new Nook and seem to be using my Kindle less. That won't last as I have a ton of books on there I want to read this year. 16. A Voyage Long and Strange - Tony Horwitz. Excellent mix of history and modern-day travel writing. Tony Horwitz recounts the story of the people who discovered North America before the Pilgrim Fathers and Plymouth Rock. Turns out there were rather a lot, Vikings, Spaniards, Frenchmen etc. It was all extremely interesting, if a little depressing, hearing how they systematically wiped out the native populations either by attacking and killing them or spreading European diseases. The Spaniards were especially talented at a kind of scorched earth policy. Horwitz himself follows in the footsteps of these explorers and debunks a lot of the myths associated with them. An excellent and informative read. 20. A Greedy Man in a Hungry World Jay Rayner. Jay Rayner is a favourite TV personality of mine. I like his approach to food on programmes like The One Show, Masterchef and various documentaries, and find his sense of humour on Twitter irresistible. In this book he debunks a lot of myths we hold dear about food production, carbon footprints, organic food, farmer's markets and so on. I found this a bit of an eye-opener about certain subjects though other things I was quite aware of. I loved the author's writing style, slightly irreverant but very informative. It feels as though you're sitting having a long chat with him. A good book to read if you're interested in how the planet's population feeds itself now and whether it will be able to in future. One thing is certain, we have some real problems ahead of us. Excellent book. Have His Carcase by Dorothy L. Sayers had me completely absorbed for four or five days, fantastic plot and great writing. Not that I didn't enjoy everything else I read as well, honourable mentions must go to A Moment of Silence by Anna Dean and A Voyage Long and Strange by Tony Horwitz which will be a contender for best non-fiction of the year at the end of this year, I've no doubt. I'm also a wee bit hooked on the Maigret stories by Georges Simenon at present. Great little reads and always nothing less than very entertaining. Also a superb read was Good Evening, Mrs. Craven by Mollie Panter-Downes. You see? There was nothing this month that wasn't very readable indeed. I feel lucky... either that or I'm getting better at chooosing books for myself. 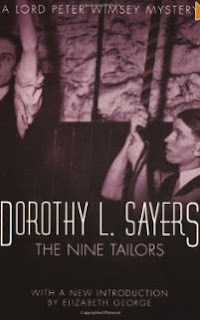 I've started March with yet another Dorothy L. Sayers - The Nine Tailors and it's proving every bit as addictive as the other two I've read. 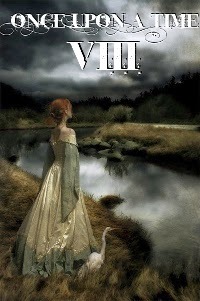 Later this month Carl's spring challenge, Once Upon A Time VIII, for fantasy books, will begin. Can't wait... I already have a pile of books waiting on the shelf.